Hello, I have a Mystery Guitar bought form Michael Horowitz back in beginning of 2010. 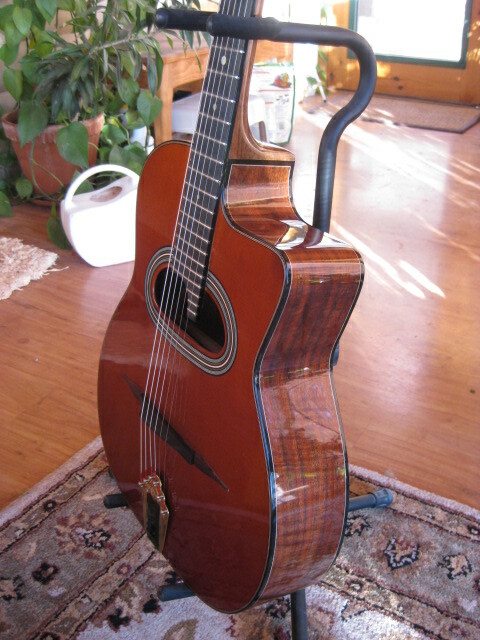 This is a great guitar built by a master builder Peter Zwinakis in San Francisco. Called a Mystery Guitar because the builder didn't want to put his name or logo on it because of some cosmetic blemishes which you have to really look for to find (mostly in the binding work) which doesn't bother me at all. The guitar sounds and plays great. I paid $1800.00 plus shipping and I had a Bigtone installed at $350.00 so $2150.00 for the guitar without shipping. It's almost a year old and has opened up nicely. No fret wear, no big scratches or dings. I'd give it an 8.5-9.0 on a 1-10 scale. I giged with this guitar and the tone is awesome, I played solo and rhythm on her and she sounded and played great. 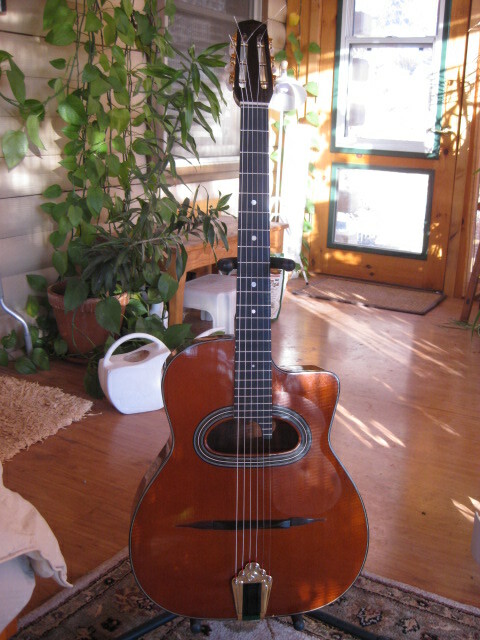 I am getting my handmade guitar now and need to sell this one, thought about keeping her but I think someone else should get something really nice without breaking the bank. 670mm scale length with an 1 3/4" wide nut. 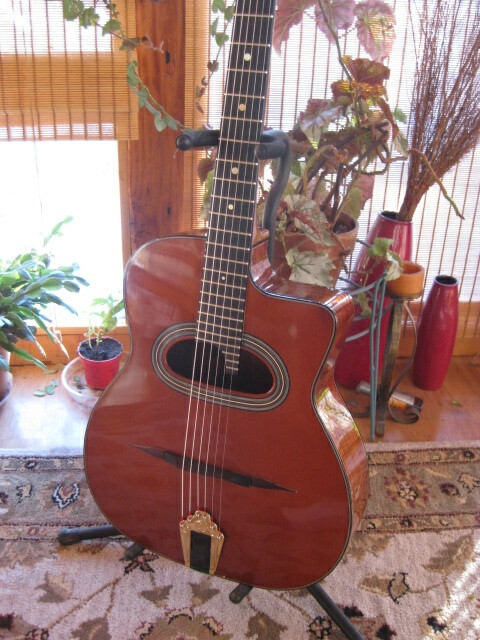 Has Argentines on her but I will throw in a new set of Galli strings .011-047 with the guitar, both Argentines and Galli's sound great on this guitar. Ebony fingerboard, nice tuners, Selmer repro tailpiece, Bigtone pickup and a TKL gypsy designed hard shell case. Cedar top with walnut back and sides and a walnut neck. Neck is real nice not beefy like some Dell Arte's, very fast playing neck. Am asking $1500.00 with free shipping to the lower 48's. PM me if you have any questions or need more pics. Right on. Love my Z. Gotta lower the high action (3.8) but it sounds pretty great nonetheless. It's a quality instrument. I pm'd you a while ago but haven't heard anything. Has this guitar been sold? Hello, I do apologize must of got lost somewhere. The guitar is still available. If you're interested just let me know.